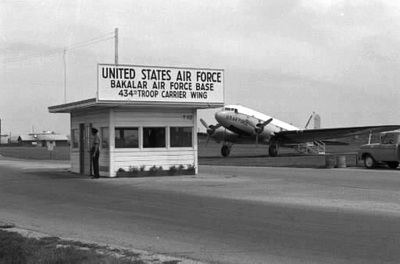 Bakalar Air Force Base, originally known as Atterbury Air Base, was opened in February, 1943. Its original name was borrowed from the Army's then-active Camp Atterbury, located only 14 miles north of the Air Base. The two installations were named in honor of Brig. Gen. W.W. Atterbury, who had been in command of transportation and supplies in Europe during World War I. A graduate of Yale University, Gen. Atterbury later became president of Pennsylvania Railroads. Its history, however, dates back to June 1, 1942, when engineers from the U.S. Corps of Engineers Office at Louisville, Kentucky, began surveying the site for the Army air Base. War Department plans for the airfield were announced in August as the area engineer arrived in Columbus. The first actual construction work began August 13, 1942, with the first concrete for the runways being poured in September. On September 17, a Navy Plane making an emergency landing on the newly-graded and still unsurfaced runways of the base took the honors for being the first plane to use the field. The first Army plane landed at the field in December, and on December 20 the first base commander, Major Ralph M. Fawcett arrived from Godman Field, Fort Knox, Kentucky. The first large group of troops arrived here in February, 1943, from Pine Camp, N.Y., under the command of Major Avery S. Keller. The following April, cadets from Freeman Field, Seymour, Indiana, began using the base for take-off and landing practice. And plans were revealed in June for activation and training of a number of ground units at the field. July was a busy month in the first year of operation at the base. On July 7 the field had its first practice gas attack from the air. And on July 8, the 431st Sub-Depot was activated at the field under command of Major Charles D. Kerswill. In September, part of a medium bombardment group with B-26 planes arrived and another similar group arrived the following January, 1944. Originally occupied in February, 1943, as an installation of the First Air Force, the base also served during its early years as a Troop Carrier command base, a Third Air Force base, and was then transferred back to the Troop Carrier Command. In addition to serving as a training base for medium bombers and for gliders in its early years, it was also used as a landing field for hospital planes bringing soldier patients to Wakeman Hospital Center at the Army's Camp Atterbury. When the end of World War II, Atterbury Army Air Base was deactivated. For three years, from 1946 until 1949, the base was closed. But following the establishment of the Air Force as a separate branch of the service in 1948, the 2466th Air Force Reserve Combat Training Center of Stout Field, Indianapolis, was given the task of re-opening the installation. Rehabilitation work was completed on the base by June, 1949, and the Indianapolis unit began moving in along with the 81st Troop Carrier Squadron from Evansville, Indiana. Once the move was competed, the first of the Air Force Reserve Wings, the 434th Troop Carrier Wing, began training here. With the start of the Korean War, the 434th was called to active duty. After receiving its initial training at Atterbury AFB, the Wing was moved to Lawson AFB, Georgia. The Wing served on active duty for 21 months before returning to Reserve status, once again coming back to Indiana. The Base was renamed Bakalar Air Force Base in a formal dedication ceremony held November 13, 1954, in honor of First Lieutenant John Edmond Bakalar. A native of Hammond, Indiana, Lt. Bakalar was killed in action September 1, 1944, over France. His decorations and awards include the Distinguished Service Cross and Purple Hear, both awarded posthumously, the Air Medal with six Oak Leaf Clusters, World War II Victory Medal, American Campaign Medal, European-African-Middle Eastern Campaign Medal with three Bronze Service Stars, Distinguished Unit Citation Emblem, Aviation Badge "Pilot" and Sharpshooter Badge with Carbine Bar. Since its return to Reserve status, the operations of Bakalar's 434th Wing have grown with crews flying thousands of hours-both on routine training missions and with active duty Air Force Wings. 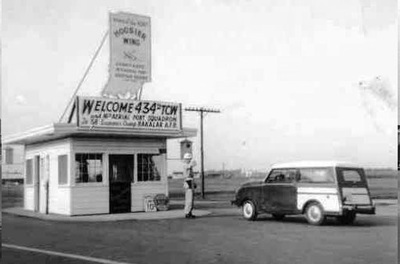 A major milestone in the life of the Hoosier Wing came during 1957 when the wing traded its C-46 Curtiss Commando aircraft for the newer, faster and bigger C-119 'Flying Boxcars." The 434th, however, is not the only unit to use Bakalar's training facilities. Since Bakalar was reopened in 1949, it has become home base for the 16th Aerial Port Squadron, the 8634th Replacement Training Squadron, and the 8505th Navigation Training Squadron. Like a man dying a slow death, the life has been going out of Bakalar Air Force Base in stages and the final stage now appears near. A caretaker crew of 17 civil service personnel will depart Monday, except for one man. Mrs. Ada A. Smiley of nearby Newbern, a budget officer and 27-year civil service veteran, said some few of the final care-taker crew, including herself, will retire Monday, while a few will get assignments to other military installations, and the rest will hunt for new jobs. The 434th Tactical Airlift Wing at Bakalar officially was deactivated December 14. A total of 166 civil service personnel from Bakalar began new jobs January 19 at Grissom Air Force base near Peru, the new home of the 930th Special Operations and 931st Tactical Air Support groups. Most officers and airmen in the two groups left on the same day. Since only 166 civil service employees, including 136 who also are Air Force Reservists call Air Reserve Technicians, transferred to jobs at Grissom. It is obvious that many were not offered jobs and many others preferred not to move. Mrs. Smiley said the payroll for civil service employees at Bakalar during a peak month before the closing was announced, was in excess of $243,000. An officer formerly at the base said the annual cost of maintaining Bakalar was more than $3,000,000. Gene Bryant of Edinburg will have the dubious honor of being the last employees to leave Bakalar. He will remain as caretaker of government property until the base is finally disposed of. Those in the caretaker group leaving Monday include Miss Florence C. Mohr, Shelbyville; Clarence Wilson, Edinburg; Morris D. Sweet, Franklin; Ed Staten, North Vernon; Forest Sheridan, Indianapolis; Joseph L. Levi, Greensburg. Also George Campbell, Seymour; Barry Buchanan, Shelbyville; Albert Cook, Edinburg; Richard Lee, Bloomington; Elmer Sandford and James Williams of Edinburgh, and Harry Markwell and Jesse Neff, both of Columbus. As Bakalar, constructed in 1942 as Atterbury Army Air Field, dies, new life is being pumped into one of the two reserve groups formerly stationed here. An Indiana congressman has announced that 16 twin engine jet attack fighter planes will be assigned to the 930th Special Operations Group at Grissom, the first reserve unit to receive jet aircraft. 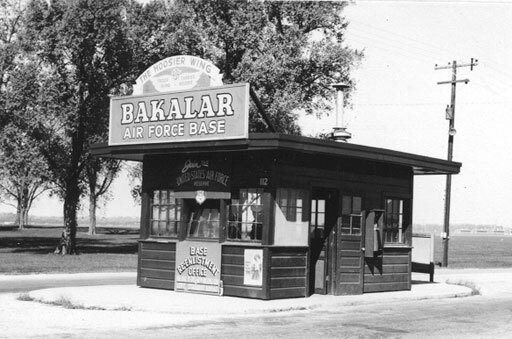 Bakalar served for C-47 troop carrier training, B-26 bomber training and for glider training during the second world war. The name of the base was changed to Bakalar in 1954, honoring First Lt. John Bakalar of Hammond, F-51 fighter pilot killed in the second world war. The air traffic control tower is unoccupied and the base chapel displays an "off limits" sign as the last of a caretaker group prepares to leave Bakalar Air Force Base to the care of the city of Columbus. The city has total responsibility for the deactivated reserve base on an interim lease agreement and hopes to acquire the base in the near future.